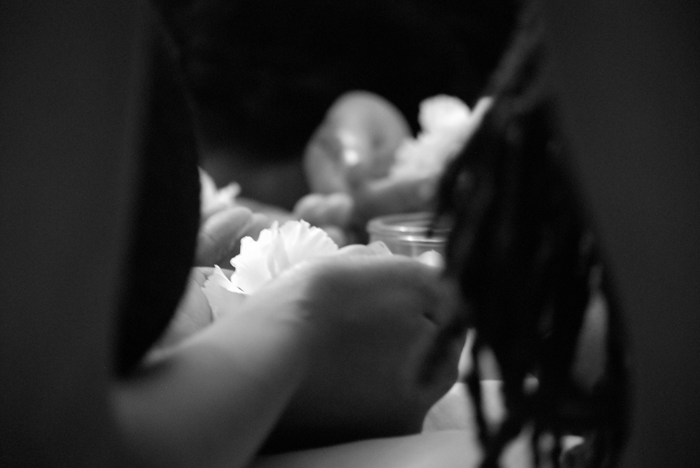 We are interested in being useful, our hashtags being a tool to advance conversation and disseminate tools for decolonial action… not existing as spectacles to be consumed and treated as an end in and of themselves. The trap of mainstream attention around these hashtags is that our decolonial projects – which are often simplified into static conversations by the media – become co-opted, and are seen as an end-point or branding campaign rather than an emergence and rupture for further decolonial action. Achieving mainstream media attention signals that our activism is starting to get attention and therefore must be acknowledged with lip service, but the mainstream media attention is a trap. The media makes our movements into spectacles, rather than acknowledging them as the origins of serious decrees for radical action. There is a common belief that activist trends magically and spontaneously happen in cyberspace and remain stuck in that medium. Although lacking a geographic home, Twitter communities are intentionally constructed through the labor of specific groups. We use Twitter to defy the limitations of time and space. We use Twitter to remember we are not alone — or crazy — but instead part of a collective struggle. The idea of ongoing decolonizing campaigns is antithetical to corporate logics and branding campaigns. Yet our stories get replaced and sold as marketable commodities for corporate consumption. They are sold as 15 minutes of entertainment rather than connected and ongoing efforts. As separate spectacles, we are less threatening. #NotYourStockWoman and #NotYourWhiteFeminist serve as evidence of co-optation of activist hashtag projects by corporate interests. These hashtags stole the construct, labor and visibility around #NotYourAsianSidekick (built by the labor and lives of women of color) to generate a new end goal: the end goal being profit for white corporate feminism. #NotYourStockWoman was a marketing scheme used by Sheryl Sandberg’s Lean In and Getty to gain free pictures of diverse and modern women. #NotYourWhiteFeminist, on the other hand, was an attempt by white feminists to deny complicity in whiteness. #NotYourAsianSidekick, which followed a series of women of color-originated hashtags before, has spun-off into #NotYourRescueProject, #NotYourTonto, #NotYourMascot, #NotYourTigerLily and more. These deviations are welcome as they strengthen the margins beyond the identity category of “asian” used in #NotYourAsianSidekick. However, we reject #NotYourStockWoman and #NotYourWhiteFeminist because whiteness owning #NotYourAsianSidekick deviations is antithetical, since whiteness is already centered as a structural position and does not occupy the margins as well. We use “sidekick” to mean “subordinate” which means our women of color hashtag developments are for the marginalized. #NotYour____, meaning we do not belong to whiteness. #NotYourWhiteFeminist is an oxymoron. It contradicts itself by trying to be both a part of women of color feminism while also apart from whiteness. The only end goal we dream of is decolonization. Corporate interests will want to trap justice in a place that is forever foreign–that place being the giant cesspool of flashy trends called The Internet. Yet work around hashtags has been instrumental in challenging those interests. A tweet using #HowIMetYourRacism. It uses a picture of Lily from the television show How I Met Your Mother wearing a kimono. 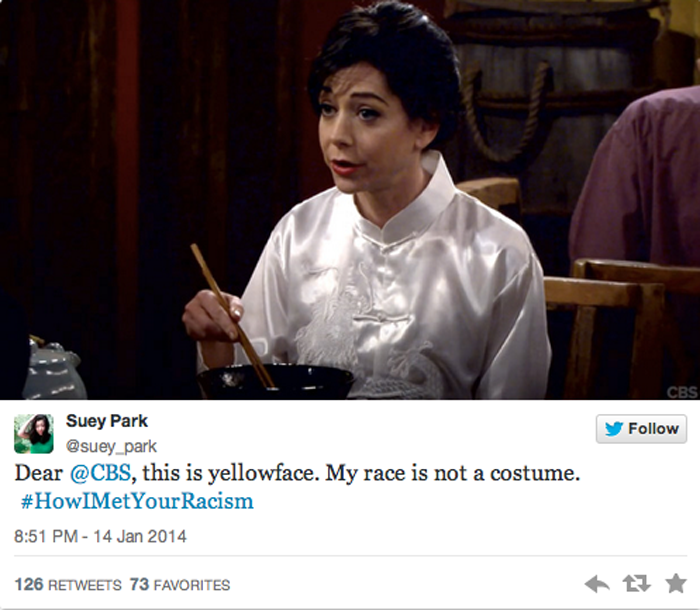 When How I Met Your Mother had characters wear a homogenized version of our cultures as a costume called yellowface, we used our Twitter community to strike back with #HowIMetYourRacism. How I Met Your Mother could no longer control its brand and was forced to apologize for having yellowface on its show. We used the same community who trended #NotYourAsianSidekick to now respond directly to an incident in real time. When the Winnipeg Art Gallery advertised that the theme for their annual party would be “Big In Japan,” and encouraged attendees to come dressed as Japanese people, we used #WAGOrientalism to voice our concerns. WAG eventually changed their theme in response to the criticism. 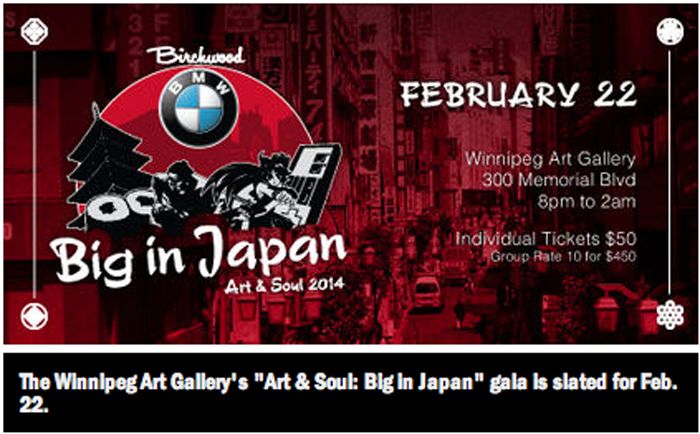 The original ad for Winnipeg Art Gallery’s event called “Big in Japan” shown in the media coverage by the Winnipeg Sun. In this sense, we see how social media can be a quick and effective tool used by activists. On Twitter, Mariame Kaba noted how before social media, activists had to stay up all night at phone banks or go door to door. Although these tactics are still incredibly useful in community organizing, Twitter allows for those with limited time and who may lack physical activist communities to take action. Social media is a place where people go to socialize and relax, but through using conversations like #NotYourAsianSidekick as a point of entry, we are continually base-building and creating a larger body of people using social media as an activist politic. Martin Lukacs and Shiri Pasternak wrote the article “Aboriginal rights a threat to Canada’s resource agenda, documents reveal” to showcase how Indigenous peoples’ social media organizing has led to corporations losing hundreds and millions of dollars, stating: “the report anticipates that as aboriginal peoples become better connected through digital media, win broader public support, and mount campaigns that more effectively impact business profits, failures to uphold aboriginal rights will carry an even higher risk.” This shows that digital life can have real compositional effects. Not only do the “white allies” in our communities ask for free re-education, but our organizational partnerships ask us to alter complicated histories of organizing for consumable, commodifiable narratives. As “The Revolution Will Not be Funded” has already stated, the desire for funding, visibility and a mainstream platform simplifies the complexities involved in difference based organizing (Grace Hong). We are not here to glorify our similarities or broadcast Asian American achievements–we wish to construct spaces of critical discussion and decolonial action, and to remember our queer genealogies. The mainstream’s rewriting of our hashtag narratives to consume genealogy/political affiliations is a form of co-optation. Radical roots get erased and replaced with a more palpable message that ensures that the imperial timeline remains intact. Institutions use these new points of origin as a signal to adapt and better disguise their politics. These points of origin are therefore points of opportunity for dominant groups to gain praise for their adaptability and top-down change-making, when the projects themselves were originally bottom-up. Despite the efforts of corporations, patriarchs, gatekeepers, and non-profits to co-opt and erase the radical origins of decolonial projects like Twitter hashtags, we will work towards building queer family ties in which our politics inform our identity–we defy blood logic. However, we see how authorities will seek to enter, claim, and police our Twitter streets. #NotYourAsianSidekick spun off from #SolidarityIsForWhiteWomen as a push for Asian American feminists to reject seeking acceptance or inclusion within white or patriarchal spaces, to exist in solidarity with women of color feminists. Angry Asian Man is not the father of #NotYourAsianSidekick. Women of color feminists birthed the ideas that made these women of color activist hashtags come into existence. We resist linear timelines. We resist patriarchal academic and activist bloodlines. To use the ideas of Jack Halbertsam, we will push against family time/nation time. We read family/nation time as forced order, as the imposition of whiteness, heteronormative and imperial priorities into our lives – the Imperial Timeline. The Imperial Timeline describes hegemonic, white, capitalistic rendering of events. It seeks to rewrite narratives, and inscribe origins according to institutional desires and the desire for profit. The imperial timeline asks us to stop our efforts and fit into their version. Every time someone asks us to define whiteness, or explain the impossibility of reverse racism, or make lists on ethnic categories, or change our origin narratives, we are really being asked to perform a gendered and racialized labor, to exist within the confines of their timeline. We are asked to take time out of our own organizing, researching, decolonizing efforts to educate and pander to an audience more ready to dismiss us than to agree with us. We will not enact this labor. 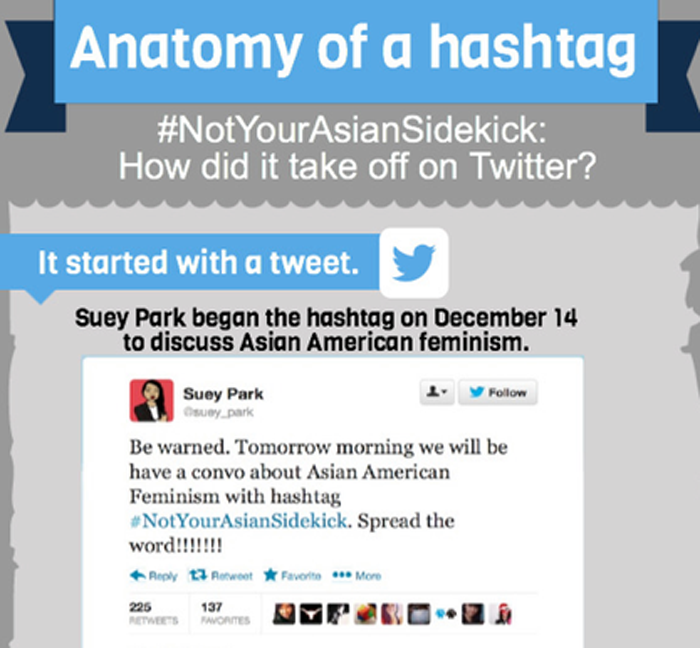 Screenshot taken from AJAMStream’s Anatomy of A Hashtag, making my tweet the point of origin for Asian American feminism. We have seen the imposition of the imperial timeline in particular with the branding of #NotYourAsianSidekick. #NotYourAsianSidekick has been problematically presented as a single-function operation. While it was founded to critically inspect the multiplicities of Asian American lived experience and reject assimilationist practices in order to extend solidarity to non-asian people of color, it is presented in the mainstream media as only concerning the ways in which Asian Americans have been oppressed, without considering or critiquing our social location among other ethnic minority groups. Furthermore, the organizing, academic, intellectual, hashtag constructions before, or even after #NotYourAsianSidekick have been sidelined, or completely erased by its tokenization. Narrowing in on one specific event, or one specific point erases a hashtag’s history, its present and its futures. #NotYourAsianSidekick has never existed in a vacuum–it exists in a continuum, within a women of color feminist genealogy — it is the continuation of a dialogue, of a series of efforts that have had successes and failures. 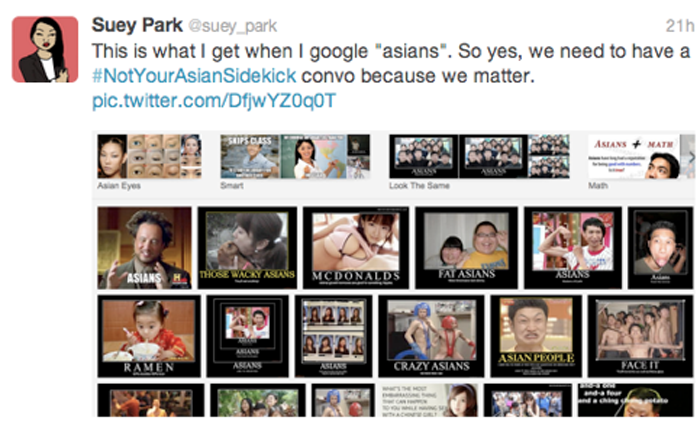 #NotYourAsianSidekick is not a monument, it is not a memorial or an object–it was invented to be useful and ongoing. Smith expands on this idea of “family” as heteropatriarchal and capitalist logic, and points out that homophobia can be a tool for the strict policing of linear “family” bloodlines within nationalist projects. Similarly, the logic seeps into the straightening and simplifying of hashtags as another form of aversion to queer families. Simplifying our digital lives results in seeing #SolidarityIsForWhiteWomen, #NotYourAsianSidekick, and #NotYourMascot as separate and unrelated, not part of a queer genealogy of radical activism. The mainstream will never understand the bridges we build across difference in our Twitter neighborhoods. Using the work of Andrea Smith, we begin understanding how slavery, genocide, and orientalism are the three pillars of white supremacy. Of course observers swooping in to co-opt, erase, steal, or gawk at our digital lives cannot understand our communities, instead simplifying them according to their aesthetic identity categories. When this happens, we see less malleability and creativity in our interventions. According to Angela Davis, “radical simply means ‘grasping things at the root’”. By seeing family time/nation time as a normative function erasing radical points of origin, we understand how white heteropatriarchy is upheld through both our gendered and racialized categories. Twitter feminism is simply a generative online manifestation of ideas that have existed in women of color spaces. We need to be less linear, and more queer with our ideologies as a solution to end capitalism and abandon the replication of oppressive exclusionary tactics within ethnic confines. Rules of gatekeeping change on Twitter. Authority can be resisted and cannot be enforced. Most recently, #NotYourAsianSidekick split into two factions. One group committed to women of color feminist politics set the dismantling of anti-blackness as both a priority and future of the hashtag. Another group insisted the hashtag belonged to the Asian American “community”. Here we see how nationalist projects ran in opposition to women of color feminist goals. We are not interested in lowest common denominator organizing. We are not interested in feel-good organizing with lip service to acknowledging our deficiencies. We are committed to digging into emerging ruptures and being useful. We have similar dreams for Twitter activism. We wish for more difference-based conversations, disidentified coalitions — for a continuum that contests its linear organization. 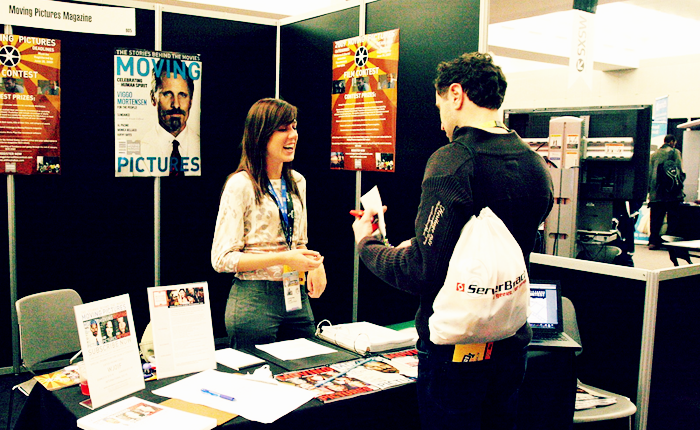 We will fight against the simplification required for branding campaigns, funding applications and award ceremonies. We hope that our digital conversations can continue to be complicated, unfixed, unmarketable, and working towards a decolonial world. We have dreams — we exist to be useful.